The Inokim Mini PLUS is the latest electric scooter designed by the Israeli-based market leader, MYWAY company. The Inokim Mini is designed to be a lightweight portable last mile solution without compromising on safety and ride comfort. The Inokim Mini PLUS weighs only 8.5kg, in addition, Inokim has managed to blend design and compactness of this model. The built-in trolley wheels on the Mini PLUS allows easy trolleying of the scooter on public transport such as MRT and bus. The INOKIM Mini PLUS comes 6-inch pneumatic front tire and a rear 6" solid tire which handles bumps & potholes well, and provides better traction on slippery surfaces, making your ride comfortable and safe. The INOKIM Mini PLUS comes with front EABS electric brake, rear fender brake, and a USB port on the front handle to recharge gadgets. The INOKIM Mini PLUS weighs just 8.5 kg and can be folded within seconds for easy storage or carrying around. 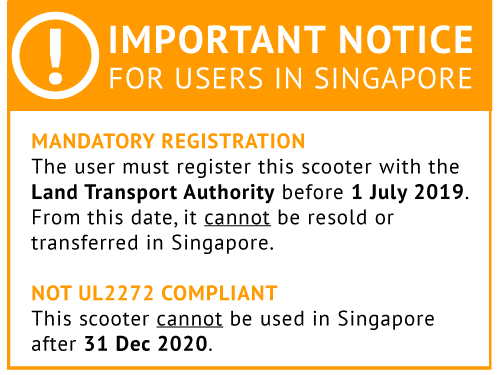 The additional trolley wheels allow easy trolley and allowing the scooter to stand vertically to save space. The Inokim Mini Plus uses the familiar thumb throttle and brake controls. A button-controlled "hybrid" version, called the Inokim Mini is also available. Check out NYLON Magazine's review of the Inokim Mini. MYWAY/INOKIM is a pioneering company which created the ‘last mile solution’ for commuting: the concept of dividing commuting into two stages, whereby long distances are covered by traditional transportation such as trains and cars, and crowded urban environments are navigated via personal mobility tools such as electric scooters. MYWAY annually invests 30% of its profits on research and development in bringing cutting edge technology into its designs, making our products the leaders in the market. MYWAY/INOKIM is the brainchild of the award-winning designer Nimrod Riccardo Sapir.